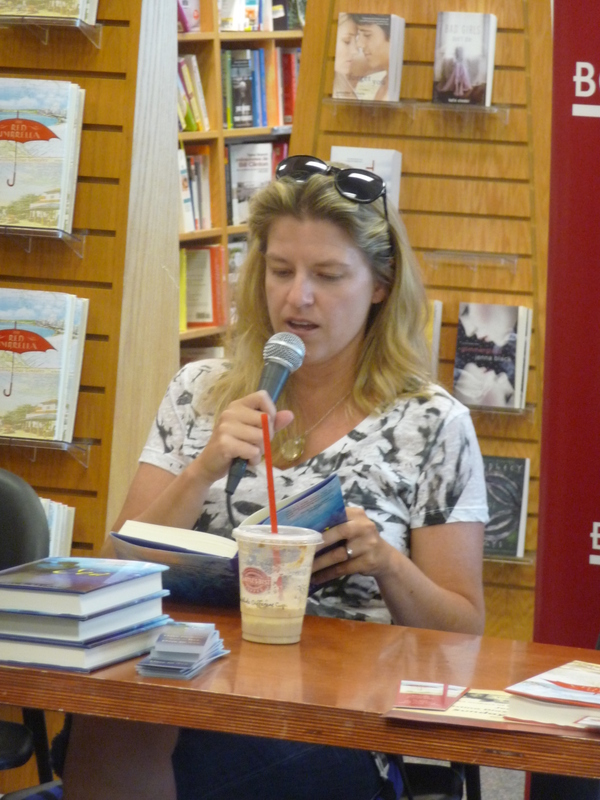 Way back in December, I signed up for the Story Siren's 2010 Debut Author Challenge. As I was searching for books to read for the challenge, I discovered Sea by Heidi R. Kling, The Red Umbrella by Christina Diaz Gonzalez, and eventually Tortilla Sun by Jennifer Cervantes. I loved all three of these books. You can find my review of Sea here, and I will be posting reviews for The Red Umbrella and Tortilla Sun later this week. Just a warning, keep tissues by you when you read them. Each book deals with the themes of loss, grief, and hope in their own powerful manner, but don't be surprised when you find yourself tearing up. After waiting for the books to finally be released, and chatting with the authors via Twitter and Facebook, I found out that not only would they be doing a book event in Southern California but that I would have an opportunity to help out. 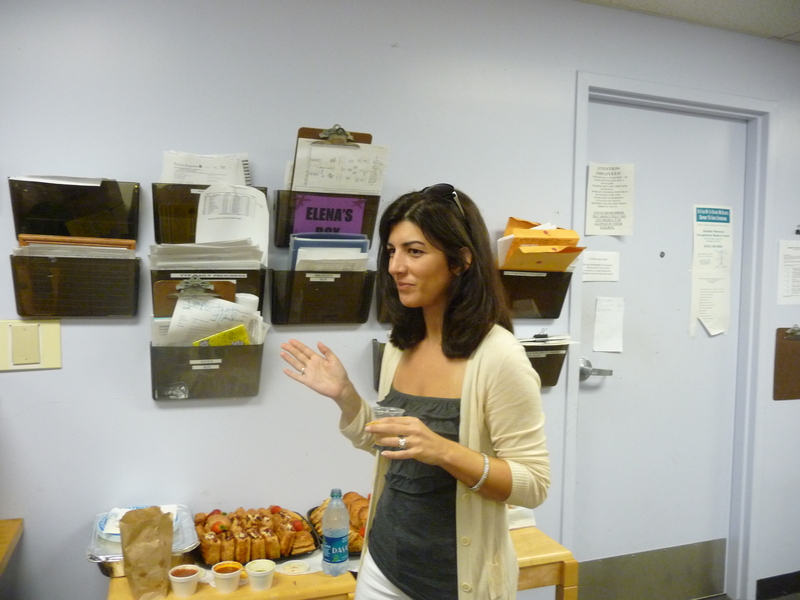 Thanks to MyGirlSnark (Amber) and Frootjoos (Alethea), I was granted "green room" privileges. 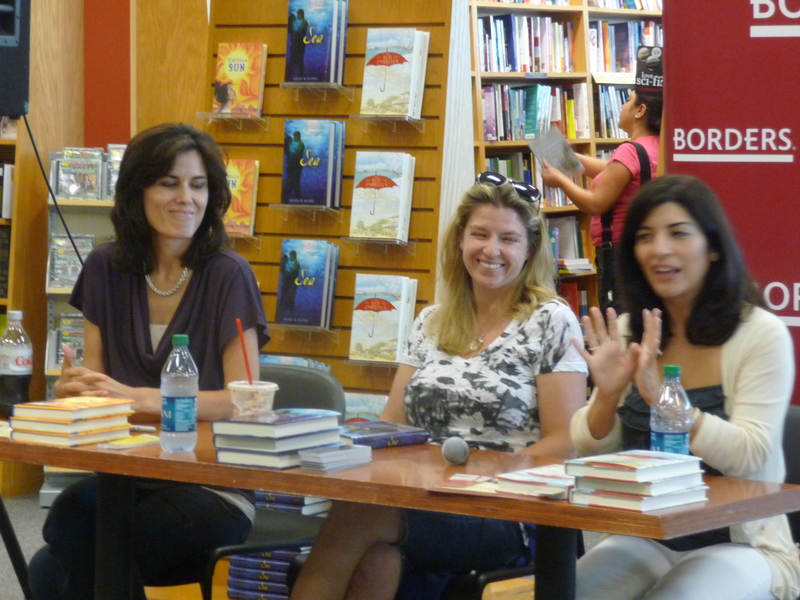 Just a fancy way of saying I had a chance to hang with our wonderful authors before the event. 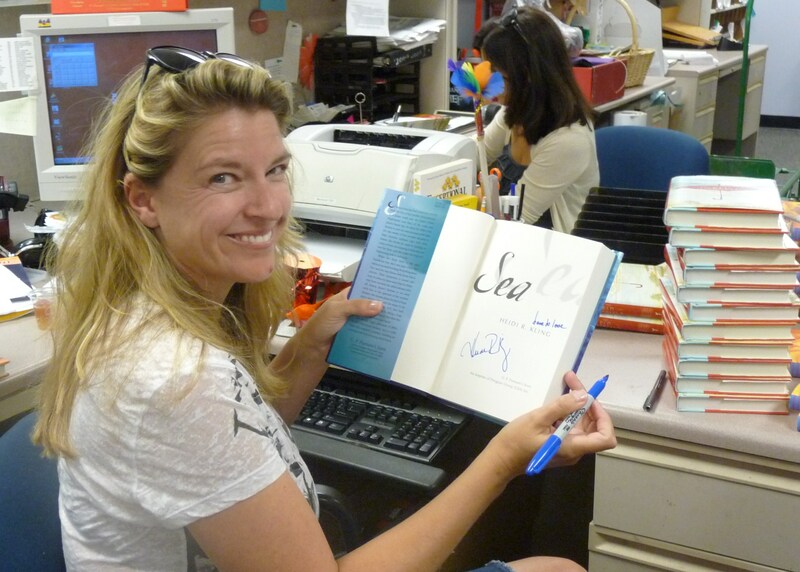 Here is Heidi signing a copy of Sea before hand (Christina is in the background signing books). Jennifer Cervantes' daughters challenged Christina to try some of the hot salsa. Here she is deciding whether or not her mouth was on fire. One lucky family won three of the prizes. Since I was helping with the Q & A, and the raffle drawing, I didn't get pictures. Next time, I need to make a list of the kind of things I need for pictures and assign someone the task (but thank you Frootjoos for trying to run around and snap some pictures). I will say the prizes were very cool. There was a Sea tank top, a red umbrella (read the book to discover the significance), a mug, and a beautiful Mexican bowl, and a couple of special necklaces. 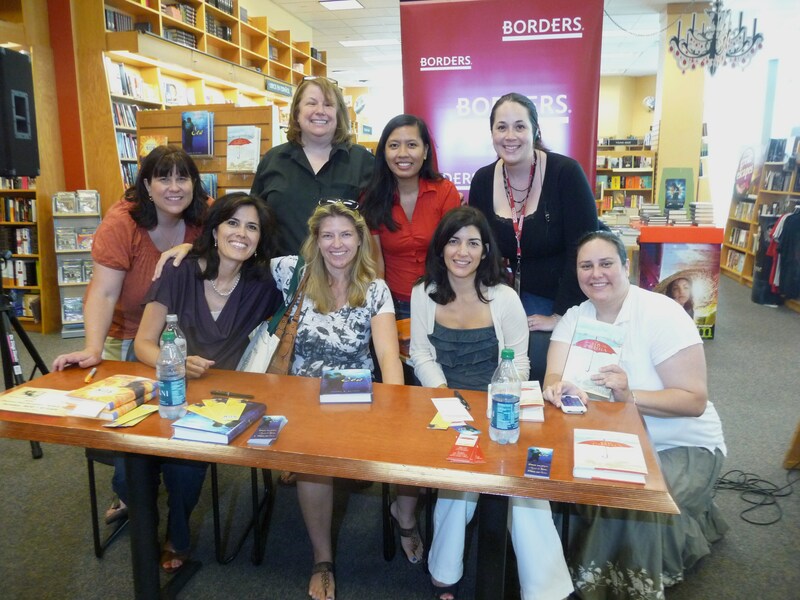 After all of the books were signed, we did manage to group a group shot of the authors, Borders Staff members, and volunteer staff. I thoroughly enjoyed myself and was very thankful for being allowed the opportunity to participate in the behind the scenes activities. This is my last known author event for the summer but I am seriously looking forward to the Smart Chicks Kick It Tour in September. P.S. If anyone is looking for a signed copy of any of these books, give Borders/Glendale a call. 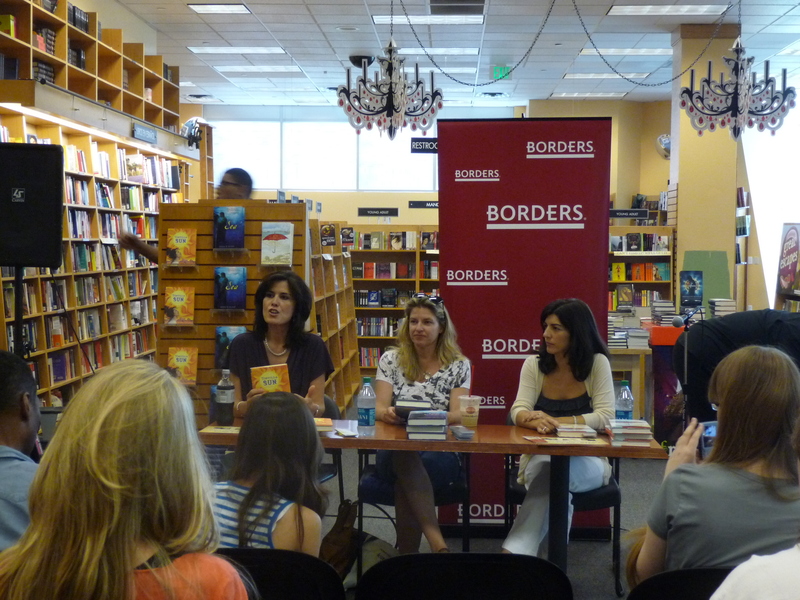 In "2010 Debut Author Challenge", "Author Events", "Book Signings", "Borders/Glendale", "Challenges", "Christina Diaz Gonzalez", "Heidi R Kling", "Jennifer Cervantes"